Georges Hadziioannou is Chemistry Professor at the University of Bordeaux since 2/2009, Holder of the Industrial Chair of ARKEMA/ANR HOMERIC “Hierarchical assembled Organic Materials for ElectRonICs”, Member of the ARKEMA Corporate Scientific Board and Senior Member of the IUF, Chair of “Physical chemistry of Polymers”. His career is characterized by a strong commitment to fundamental research at different universities and research institutes worldwide and an important industrial tenure at IBM Almaden Research Laboratory (San Jose, California). He has pioneered work on nanostructured polymers materials with innovations in flexible and printable organic electronic materials as well as energy and information technologies. His research effort led to more than 340 publications (H = 58) in internationally peer-reviewed journals. He has been an invited and keynote speaker at many conferences (155 since 1994). Throughout his career, he has been deeply involved in teaching at the undergraduate and graduate levels and has guided a substantial number of young scientists. He supervised 47 PhD’s and hosted in his laboratory more than 65 post-docs and invited professors. He has 36 patents as a result of his research. He was co-founder of 3 start-ups (“Polymer Service Center” now “PolyVation”, “Papyron”, “Polpyphos®”). In addition to education and research, Prof. Hadziioannou had numerous and important management positions and he participated in various administrative committees along his entire career. He has been and is a member of many scientific advisory boards of many institutions and member of the editorial boards: ChemPhysChem from its creation until 2004, Advanced Materials, Macromolecules and ACS Macro Letters. His research area covers semi-conducting polymers, nanostructured polymer materials, polymer materials for the storage and transfer of information, organic electronics and systems thereof. Cyril Brochon received his PhD in Polymer chemistry at the University of Bordeaux in 1999, where he studied synthesis and anionic polymerization of novel silicon-based heterocyles. Then he learnt controlled radial polymerization at the Charles Sadron Institute (ICS, Strasbourg). 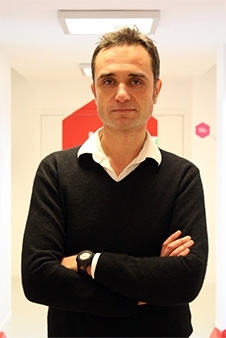 In 2001 he joined the team of Pr G. Hadziioannou in ECPM (Strasbourg) as assistant professor, where he studied the design of functional polymers, including semi-conducting polymers and block copolymers. 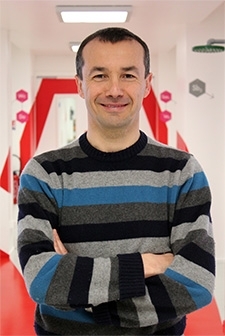 In 2009, he joined the LCPO in Bordeaux as associate professor and he is currently working in the group of Pr Hadziioannou on the design of advanced functional polymers for applications in energy, optoelectronics, photovoltaic, (flexible) displays, etc. Cyril Brochon is the coordinator of several research programs. He is coordinator of the “Chemistry cluster” of the “ElorPrintTec” EquipEx and he is a member of the National University Council (CNU, section 33). He obtained the "Prix La Recherche” (field : Chemistry) in October 2013. Cyril Brochon is author of 60 publications and 12 patents (H index = 18). Topics: Design of π-conjugated (co)polymers; Dispersion polymerizations; Conductive inks, Functional Polymers for photovoltaics, optoelectronics, batteries, energy, displays, etc. After receiving a Ph.D. in Polymer chemistry (under the guidance of Dr Yves GNANOU and Pr Didier ASTRUC) at the University of Bordeaux 1 (in 1996), and completing a one-year post-doctoral fellowship at University of Akron (OHIO, USA) with Professor R. P. QUIRK, Eric CLOUTET became a CNRS (the french national center for scientific research) researcher in 1997. He was recruited at the University of Paris 13 in the laboratory of research on macromolecules to work with Dr A. SIOVE on the design and synthesis of new carbazole-based electro-luminescent polymer materials (1997-2000). He was transferred in 2001 in the laboratory of organic polymer chemistry at the University of Bordeaux 1 in the group of Professor H. CRAMAIL. He became a CNRS Senior Researcher in 2012. 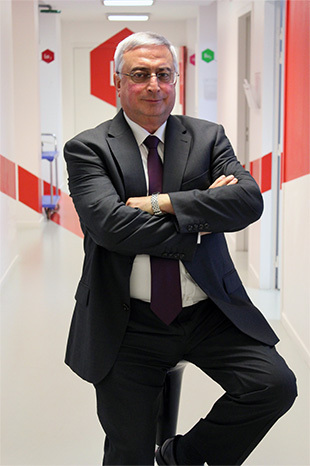 He is currently working in the group of Professor Georges HADZIIOANNOU on the design and formulation of advanced functional polymers for applications in energy, optoelectronics, batteries, photovoltaics, (flexible) displays, etc. Dr Eric CLOUTET is the coordinator of several research programs. He was awarded Samsung-IUPAC Young Polymer Scientist in 2008 and "Prix La Recherche" (field: Chemistry) in 2013. 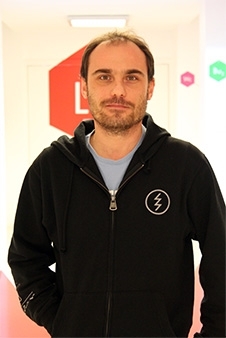 Dr Guillaume Fleury graduated from Strasbourg engineering school (EPCM) in 2002. He received a PhD in Materials Science at the University Louis Pasteur of Strasbourg in 2005 working on a new topological polymeric material. Following his PhD he completed a postdoctoral fellowship at the University of Minnesota in the Chemical Engineering and Materials Science department under the supervision of Pr Bates working on multiblock copolymers and their self-assembly. He was recruited in 2009 as an Assistant Professor in the group of Pr Hadziioannou for his expertise in the characterization of complex polymer systems. Dr. Eleni Pavlopoulou studied Physics in the Aristotle University of Thessaloniki, Greece, and received a M.Sc. in Materials Physics from the same University in 2004. In 2009 she obtained a PhD in Polymer Physics from the University of Crete, Greece, working under the supervision of Prof. S. H. Anastasiadis in the Institute of Electronic Structure and Laser of the Foundation for Research and Technology – Hellas, IESL-FORTH. Then she moved to Princeton University, USA, and the group of Prof. Y.-L. (Lynn) Loo where she was introduced in Organic Electronics. In 2011 she was recruited in Prof. G. Hadziioannou’s group in Bordeaux, for a second post-doc in Organic Electronics. Since September 2013 she is an Assistant Professor at the ENSCBP -Bordeaux INP, carrying out her research in LCPO. Dr. Eleni Pavlopoulou is in charge of the activities of the Hadziioannou’s group concerning ferroelectric polymers. She is also involved in fabrication and physical characterizations of the organic electronic devices developed in the same group. As a student she received several scholarships from the Greek State for her ranking among her fellow students while in 2007 she was awarded by the Panhellenic Society of Solid State Physics and Materials Science as the most promising young researcher. In 2011 she received a Marie Curie fellowship (Intra-European Fellowship – Support for training and career development of researchers). 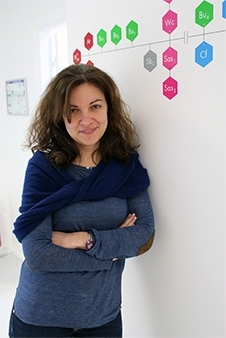 She was part of the team of Prof. Hadziioannou that won the 2013 Prize of the French science magazine "La Recherche" in the chemistry category for their work on the use of block copolymers to stabilize organic photovoltaic cells.